It’s cold. Too cold. I’m tired. I’m hungry, but all I have to eat are the packages of beef jerky I pilfered from a frozen corpse earlier. I can no longer feel my feet. It’s dark, the only light coming from the starry sky and the Northern Lights overhead. Stumbling back towards a wayward cabin I found earlier, I hear the sound of a wolf howling. Frantically, I search around me for the glint of the creature’s eyes. Before I even realize it, I’m being mauled by the beast, its sharp teeth ripping into the layers of winter clothing I just repaired. I’m able to kill the thing, but not before I’m bleeding pretty badly. I search my pack, but to my dismay I don’t see antiseptic. I bandage the wound so I don’t die from blood loss and walk back into the cabin. Seeing the bed, I lay down for a few hours to rest a recover. A while later I’m on my last leg, the wound from the wolf festering thanks to my inability to find anything to dress my wound properly. 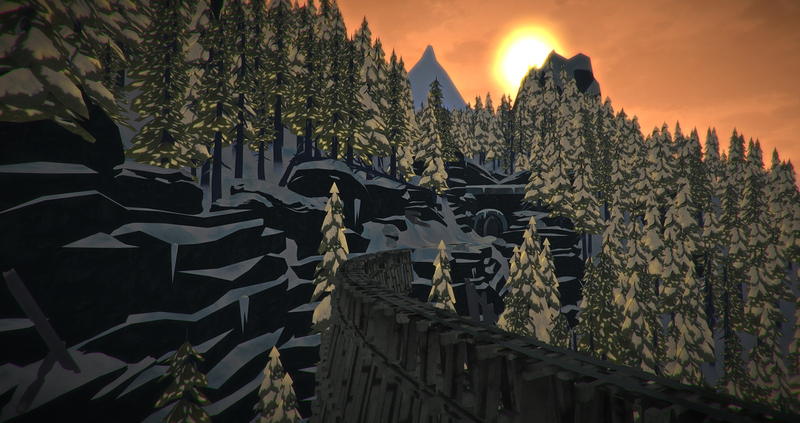 Eventually I succumb to the disease and The Long Dark finally takes me. This is but a taste of one of my many playthroughs of Hinterland Games’ Survival-Sandbox game, The Long Dark. Currently in Early Access on Steam, you are a survivor of a geomagnetic cataclysm that causes your plane to crash in the Great White North with nothing more than a few supplies and clothes on your back. With a full day and night cycle, hazards are around every corner. When I first booted up and launched The Long Dark, I was at first taken in by the visuals. The beauty that Hinterland has portrayed through their unique art style left me breathless. The game looks as though you are traversing through a painting. I was brought back to reality when a message on the right hand side of my screen showed me that I was freezing. I stumbled upon a small shack and took cover in there, warming a bit, though I was still at a loss as to what to do next. Since the story mode isn’t available with the alpha, the game is a true sandbox — you are dropped in and left completely up to your own devices. Pressing the TAB key lets you take stock of your situation. It shows the temperature, the time, your condition as well as gives you a few options such as “Harvest,” which has you gather usable firewood, as well as the ability to lay down a firepit. The game monitors your Fatigue, Cold, Hunger and Thirst. Also measured are your calories as well as calories burned by the hour. This really makes eating a priority, as everything you do burns calories, just like in real life. Want to sleep? You can, but it will burn calories. Running? Sure, but have an energy bar waiting. Thirst is also important, and the game provides you with some great ways to satiate that yearning. When you have a fire you can melt snow and then boil the liquid to make it drinkable (that as my mistake). You can also find water bottles and soda throughout the world, as well as food lying in packages. Your major food source may come from the occasional MRE (Meal Ready-to-Eat) found in a cabin, but the wildlife also gives you a great source of food. If you don’t have a rifle (which I never had, but I’ve had the ammo), you might get luck and find a carcass in the snow. You might be even luckier and find it fresh and not frozen. Without tools, a frozen carcass is almost impossible to gather meat, gut and hide from. Almost. The game rewards common sense. I found a carcass in the snow and was lamenting the fact I had no food, was low on calories and I had not the tools to harvest the meat. I thought about what I would do in that situation in real life, and immediately built a fire right next to the body. Within an hour (in-game time) the carcass had thawed halfway and I was able to harvest a few slabs of deer meat for food. The fire went out and it was frozen again within a few minutes. That kind of interaction with the environment really immersed me into the game, however, and I was celebrating like I used to on High-Adventure campouts as a Boy Scout back in High School. The lonely lake is full of surprises, ones that are all worth exploring. I have played the map about ten times (my longest playthrough lasting about 14 in-game days. I died due to a wolf’s bite on that one as well) and not once started in the same area. I have stumbled upon familiar landmarks, but each game feels fresh as each playthrough presents its own level of challenges. One might place you into the wild with a massive blizzard obscuring your view and causing freezing temps to come on faster. Another may give you a clear morning, only to turn into a light, pleasant snowfall. I’ve also been placed in the middle of the forest close to nightfall, and while the Aurora Borealis is beautifully represented in game, the howl of wolves does take away its normal luster and appeal. For a game that is still in early access, The Long Dark certainly has all the elements of a great game as it is stands now. With the addition of the story mode and some features in game that are currently missing, Hinterland will undoubtedly have carved a niche all their own in the survival genre. While other games today pit you against zombies, Hinterland has pitted you against The North, and yourself. If you can slay the elements and stay out of your own way, how long will you survive? You can pick up The Long Dark on Steam here.